"Alexandria Ocasio-Cortez False premise 1: (non-tax contributions) 1- Amazon purchased $11B in Federal bonds last year. 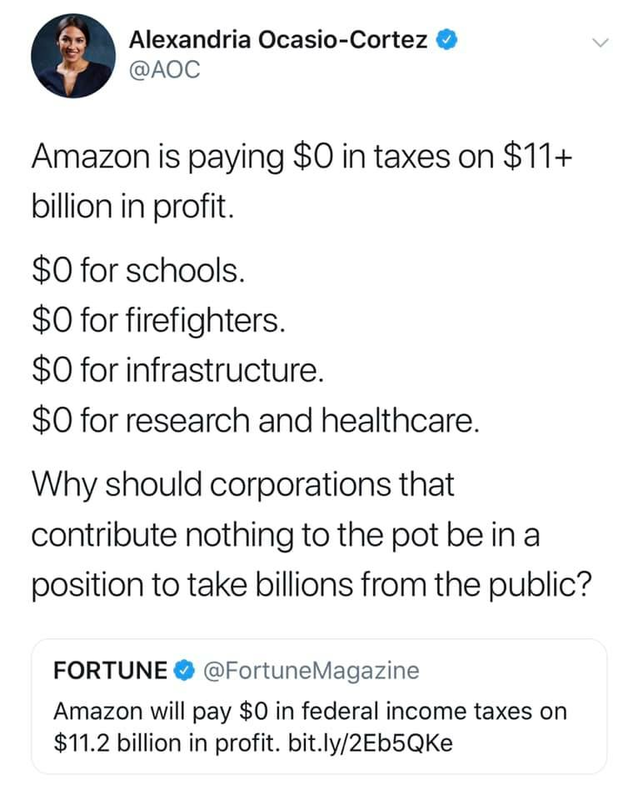 Literally, Amazon put more than its total net income into "the pot". 2- Amazon collects sales tax on all US purchases - thus *every* sale in the US contributes to the tax coffers. 3- Amazon employs well over half a million persons - and is approaching the same number as the total population of Seattle. While some of those are in other countries, the majority are in the United States - and FITW applies to all of them. 4- Amazon sells to - or facilitates sales to - international customers, thus foreign wealth is transferred into the US, increasing the total wealth of the US - and thus the pot gets bigger."